An Affidavit of Heirship is a legal form used to transfer the ownership of property when someone has died without a probated will. 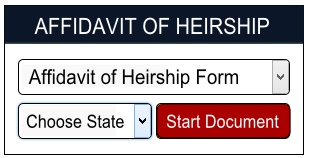 An Heirship Affidavit is very useful when the heirs are known and the facts surrounding the estate are not in conflict. The document contains facts about the Decedent, the property, witnesses, heirs, will, probate, and a place for signatures. When a family member dies without a will. To legally assert the heirs of the deceased person. To affirm the legal rights as an heir over the personal and real property of the deceased person. Or, just go here to start a free Affidavit of Heirship form customized with your personal information completely online. __________________, on or about ________________________ day, being _______ years old at the date of his (or her) death. 2. Said Decedent owned, at the time of his (or her) death, the land situated in County/Parish, State of . 3. The land described above was / was not occupied as the homestead of the deceased. 4. The land described above is / is not now occupied as homestead of deceased’s surviving husband / wife. 4. Is administration pending on the estate of decedent? If so, in what court, county/parish and state? Has administration been completed? If so, has final order or decree of distribution been rendered by the Court? 7. Were you acquainted with decedent’s business affairs? Did decedent leave any debts or obligations unpaid? Have all such debts or obligations been paid? If not, how much remains unpaid? What is reason these debts have not been paid? Note: If decedent left a Will, but said Will was NOT probated, the laws of Intestate Descent and Distribution will apply, and NOT the terms of the Will. 3) If any brother or sister died before decedent, also list his or her children. cousins; if none of foregoing survived, list nearest of kin surviving. 14. Did decedent file in County Clerk’s office election to come under the Community Property Act? Subscribed and sworn to before me this _______ day of _________________________________________, 20_______.